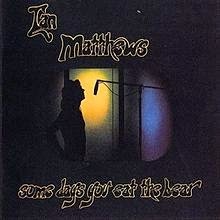 Some Days You Eat The Bear (or to give its full title, Some Days You Eat The Bear And Some Days The Bear Eats You) was Ian Matthews second solo album on Elektra Records since moving to California. It was another excellent, solid country-rock offering. As usual he including some interesting cover songs, here featuring his own versions of Tom Waits' "Ol' 55", Danny Whitten's "I Don't Want To Talk About It", Gene Clark's "Tried So Hard" and Steely Dan's "Dirty Work", plus songs by Pete Dello and Jesse Winchester. It also featured some good originals - one of these, "Keep On Sailing", was actually a re-recording, as another version had already featured on his last album. The album got a good critical reception, but saw no real commercial success, and so unfortunately he was subsequently dropped by Elektra. Thank you for this rare find, one of his most overlooked. In Fairport form! Am I missing something?...the Download link is a copy of the link to the post of Valley Hi...no bear there! Can you check this out...thanks for the great music.